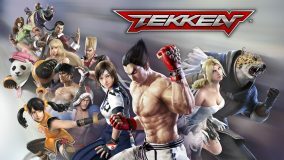 The world’s most successful fighting game Tekken franchise has been brought to mobile! 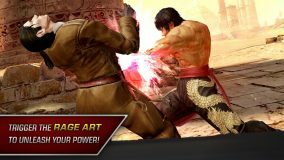 Join famous fighters to engage in an intuitive, deep combat system featuring fighting techniques from all around the world. 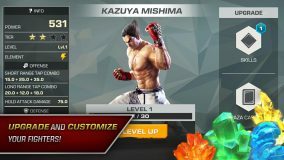 Take on the role of the Dojo Master, collecting, upgrading and battling with your favorite fighters from the legendary TEKKEN games! Many Tekken Fans out there would rejoice regardless of the fact whether the game is good or bad. 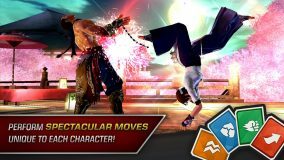 This fighting game doesn’t have the depth of its console or computer counterparts, its solid controls do make this one of the better fighting games for mobile systems. Like other versions, this version of Tekken casts you as one of the colorful contestants of the King of Iron Fist tournament. Using simple controls, it does a good job of replicating this popular and long-running series, especially since it adds a card system that lets you deploy special attacks. It also features numerous colorful characters to play along with a lot of interesting locations. But your characters don’t regain their health in between fights, you have to heal them with pickups you buy or earn. This version also doesn’t have a deep combo attack system like the console versions. Still, it’s a good time pass when you have nothing to do. 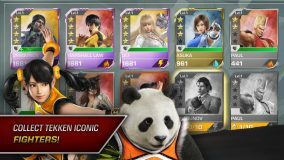 In this mobile version of TEKKEN you will be competing in the King of Iron Fist tournament. Playing as a number of colorful characters, players use simple touch controls to land a series of punches and kicks in an attempt to beat down their competition. But while this does add cards that can trigger special attack moves, this version has been simplified compared to other takes on the franchise. Ads are a nuisance and sharing with friends seems compulsory in order to obtain power-ups. But if you are a fan than these might seem like little obstacles to enjoy the nostalgia bringing characters and stages. New players might not be able to get the proper feel especially if they haven’t played Tekken 3 on a console and especially with all the different high end brawl games available in the market, try the classic Tekken 3.